The Wellington was widely used as a night-time bomber in the early years of World War II eventually being replaced by larger four engine bombers like the Avro Lancaster and Halifax then serving as a costal patrol anti-submarine aircraft until the cessation of hostilities. It is of note that n late 1944 a radar-equipped Wellington was modified for use by the RAF's Fighter Interception Unit as an Airborne Early Warning and Control aircraft, it operated at an altitude of some 4,000 feet over the North Sea controlling de Havilland Mosquito fighters tasked with intercepting Heinkel He 111 bombers inbound from Dutch airbases carrying airborne launched V-1 flying bomb ("Buzz Bombs" or "Doodle Bugs"). Eight .303 Browning machine guns, two in a nose turret, two in a tail turret and one either side of the fuselage in the waist position. 4,500 lb (2,041 kg) bombs. The Wellington's utilisation of Barnes Wallis's famous geodesic method of construction for it's airframe created a very resilient aircraft, this can be clearly seen on this Damaged RAF Wellington which was still able to land safely after sustaining severe battle damage it's rear fuselage completely loosing it's tail gun turret . 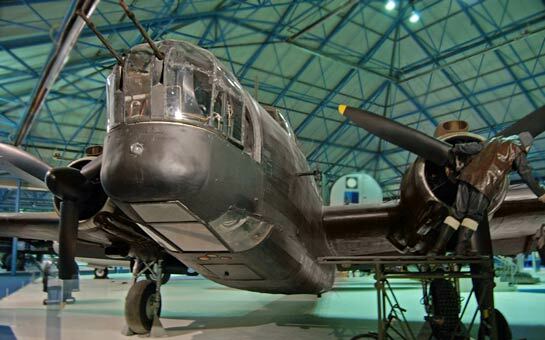 The top picture of Vickers Wellington is Copyright © June 2014 Siteseen Ltd. We only authorise non-commercial picture use and particularly encourage their use for educational purposes. This Vickers Wellington picture is not in the Public Domain. 3) Use of this Vickers Wellington picture, or any of our pictures on websites re-distributing copyright free material is strictly prohibited.